and the vendor started handing me a whole bunch saying nobody wants them and they were going soft! 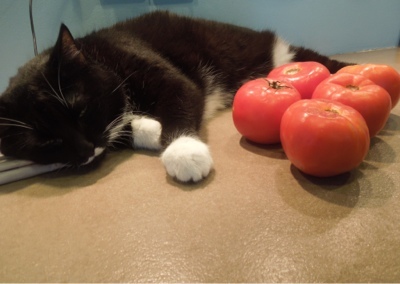 So I got seven Tomatoes for a dollar! A dollah! Thanks, Ingrid! Bye for now. Such a great deal on the tomatoes!! It's nice to have an "in" with the produce person! Toasted bagels are made for Tofutti and veggies of choice (we all know that cucumbers are also a favorite!). 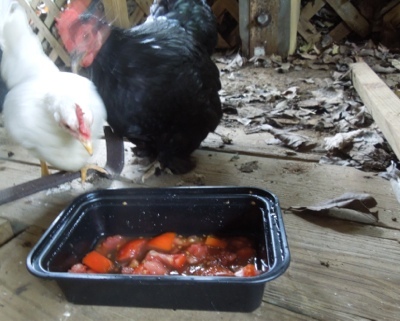 Glad the chickens enjoyed the tomatoes as well! 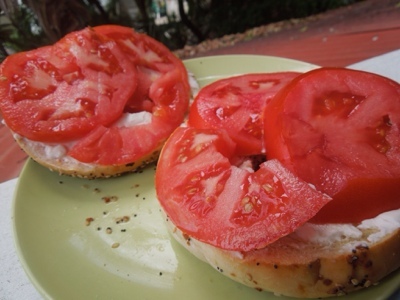 I am loving these Tomato and Cream Cheese Sandwiches. It is just hard for me to be as patient as you and let the Bagel get practically burnt before schmearing. Yay!!!! 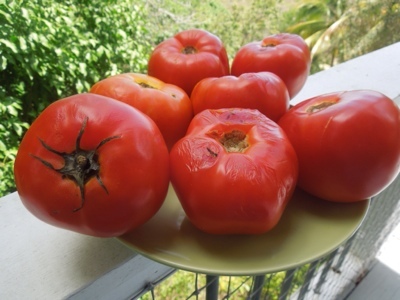 Those tomatoes are so gorgeous and what a great price! I'm sure the chickens were really appreciative as well. I had a feeling that things we take for granted here would be harder to find and more expensive there. I'm sure you really enjoyed that bagel, it looks great! I can't deal with that last picture. Too cute for words!! I was ready for a great deal after all the money I spent and lost getting down here. 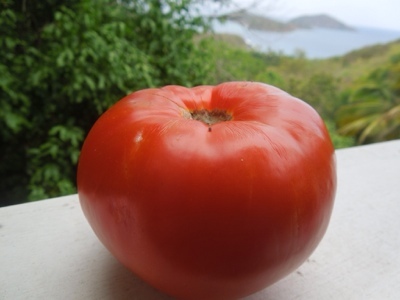 Seven Tomatoes for a dollar made it all even. Soo many beautiful pineapple and mangoes! That's an amazing deal for the tomatoes. I wonder why no one else wanted them? 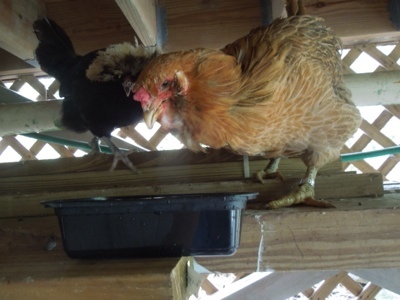 I love seeing pictures of you're chickens! How are all the kitties adjusting? 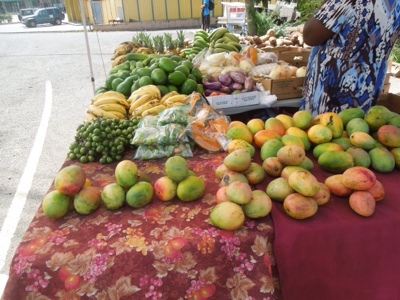 Mangos are in abundance here. Surprised Pineapples are so plentiful. Maybe I will buy one to see what's up. The barn cats are still pissed. So pissed. 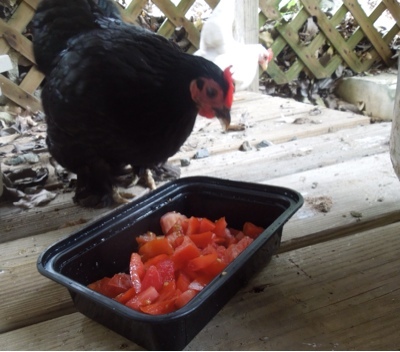 I love that the chickens want tomatoes! 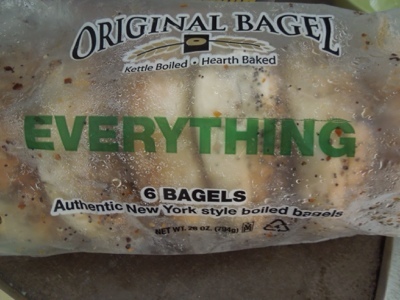 The price is right on both the tomatoes and the bagels, that makes up for the Tofutti. 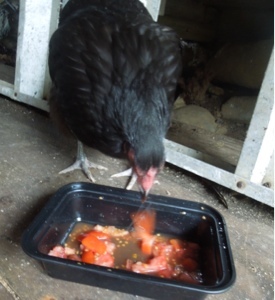 The chickens love everything except citrus and beans. Nice find!! 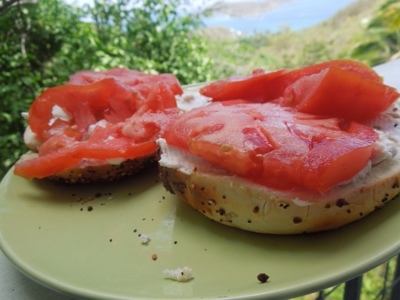 The tomato tofutti sandwich combo is such a perfect summer meal. 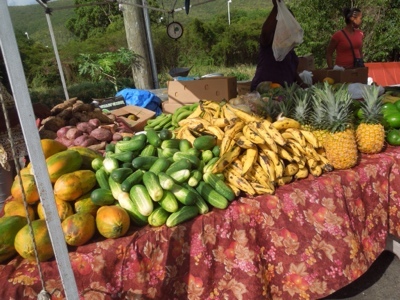 You'll definitely need to investigate the pineapple and mangos from the farmstand. I refuse to fry at home -or turn on the oven right now- so dunno what all to do with the plantains. I like the sweet maduros preparation of them with brown sugar but i think that's a dominican/puerto rican thing. I am finally gonna be like you, but all year long: no turning on the oven. I can use the toaster oven though. I will pick up a Pineapple this weekend to see if they're any good. The last mango I had didn't thrill me.